The Spanish National Police has exposed the arsenal of war seized in January in Spain during operation Portu, supported by Europol. 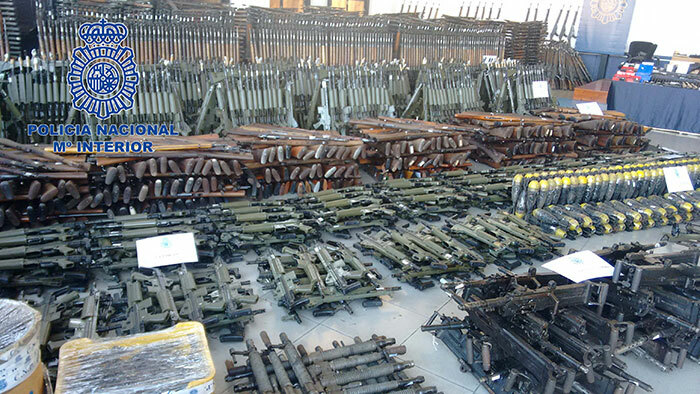 Over 10 000 assault rifles, anti-aerial machine guns, 400 shells and grenades, as well as pistols, revolvers and parts to reactivate weapons, have been catalogued. Operation Portu, against illicit firearms trafficking, was carried out by the Spanish National Police, with the collaboration of Europol, on 12-13 January 2017. Europol actively participated in the investigation by providing operational and technical analysis, and on-the-spot support. The organised crime group sold deactivated firearms which did not comply with the existing deactivation standards, and live firing firearms, in Spain and other European countries like France and Belgium. The armament was acquired mainly through legally established channels and later reactivated. 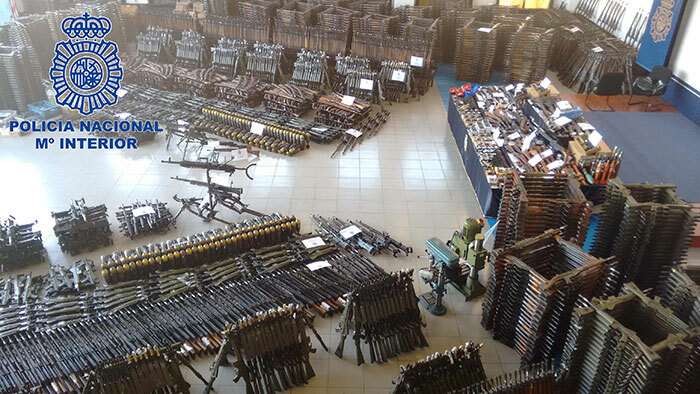 As a result of the investigation, a huge military firearms depot was seized that required several weeks to catalogue. Due to their characteristics, their calibre and their readiness for reactivation, the seized weapons had an easy journey in the black market and posed a significant risk of being acquired by organised crime groups and terrorists. In total, more than 10 000 assault rifles were counted, anti-aerial machine guns and numerous guns and revolvers, all of them ready to be repaired and transformed into firearms. Over 400 shells and grenades, as well as essential parts and components such as barrels, were also seized. Investigators also found an illegal workshop with different machinery to manipulate and reactivate weapons. Firearms traffickers exploit legal loopholes and differences in legislation between EU Member States to divert firearms from legal suppliers. The reactivation of deactivated weapons and conversion of blank-firing firearms are among the main sources of illegal firearms trafficked in the EU (see EU Serious and Organised Crime Threat Assessment 2017 (SOCTA)). Since 2014 Europol has seen a significant increase in the supply of this type of firearms to criminals and organised crime groups and actively works to disrupt the illegal flow of firearms. For more information please see the Spanish National Police press release.